Plenty of people rent living space in New York. The New York Times puts the Big Apple alone in America’s top five rental markets – with 65% of its citizens renting – and the city holds more than 40% of NY’s total population. Statewide, the proportion of renters is 46%. These numbers don’t match up with the number of renters who take out insurance (only 41% have a policy, according to the Insurance Information Institute), however. Many renters simply don’t understand the value of insurance or they think that their landlord has them covered on all of the important things. Unfortunately, this usually isn’t the case. Doesn’t my landlord cover everything? No. Your landlord’s insurance only covers the structure itself. You, your possessions, pets, and visitors are not protected by your landlord. You’re liable for any damages to property or people on the premises. A renters policy will help prepare for those possible costs. Renters insurance also helps in the event of environmental damage; a wise move, since the weather has been New York property’s worst enemy in recent years. Check out our previous blog to see a specific list of hazards covered under a policy. How do I effectively insure my possessions? Inventoried possessions are easier to value and receive compensation for. Your rental insurance provider may require photographs/video of everything you own that may be covered by a policy. New York state provides a helpful guide to doing an effective inventory; make sure to consider actual vs perceived value, which is how much an insurer is willing to pay to replace an item versus how much you feel it’s worth. Items of great sentimental value, for example, can be protected by taking out a separate rider for that item along with your overall renter’s insurance. Page nine of the NY State guide provides some figures on how much different types of possessions can be insured for. Flood damage coverage requires its own policy and can cover tenants for up to $250,000. This policy protects your possessions and pays for the cost of debris removal, among other things. The average cost of a New York flood claim this year was around $878, according to The New York Times and the National Flood Insurance Program. How much you need to pay for a policy varies depending upon your rental property’s location. Higher-risk areas cost more, of course, but extreme weather can quickly turn almost any location into a disaster zone. You can use FloodHelpNY to find out how much risk your rental runs. Burst pipes and other domestic leaks don’t classify for coverage under flood insurance, so be sure that your renter’s policy and/or landlord protects you in those cases. In addition, vermin and parasitic insects have often considered home maintenance problems – which means they may be the renter’s responsibility and not the landlord’s. For some good news, read our blog on all of the things you are covered for by a standard renters policy. How much does renters insurance cost and do I really need it? A basic policy may cost only around $300 a year and provides up to $50,000 in coverage; a figure dependent on the insurer, the items insured, and the location of the home. The choice of taking out policy may be out of your hands if you find a place you like, however. 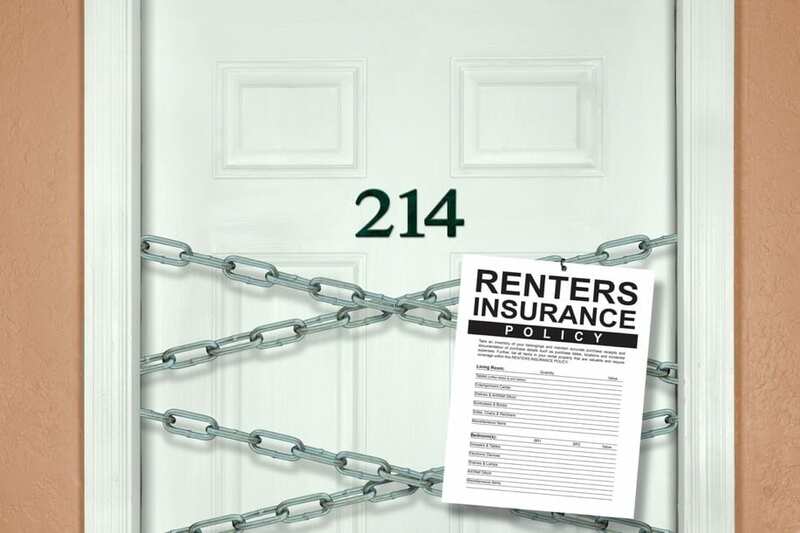 Some landlords won’t accept you as a tenant unless you have renters insurance. Can I reduce my renter’s insurance? Your provider may cut you a deal if you get both your renters and auto insurance policies from them. Finding a rental in the safest area possible is another way to save; proximity to heavily populated urban areas tends to increase crime and the risk to you and your possessions. Showing your insurer that you’ve taken measures to protect yourself and your property can help lower your premiums – things like adding smoke and security alarms and reinforcing door and window locks. Increasing your deductible can also lower your monthly payments, and some renters choose to pay the policy in one lump sum at the start of the year, which usually means a modest discount. You’ll need to decide if the claim falls under liability, property damage, or property loss. Take notes and photos/video to provide proof of the claim and call the police or fire department if doing so is relevant (you’ll need a copy of their report). Quickly contact your insurance company to inform them of a claim, and make sure to fill out all of the required paperwork. Delays lead to doubt from insurers. Liability claims will require how, when, and where the incident happened and the testimony of any witnesses. Your insurance company should provide a lawyer and help with legal fees if a claim involves going to court. Beware of how problems such as broken windows or floods that may be your fault expose your rental to ongoing damage and could invalidate a claim unless they’re remedied beforehand. If your claim is rejected, it’s up to you whether you want to challenge the refusal; this can take a good deal of time and effort, and legal fees may be high. You’ll stand the best chance of a successful challenge if you’ve meticulously cataloged your possessions and documented the damage event, plus taken all possible steps to mitigate its impact before, during, and after the event. If you’re ready to shop for insurance, compare renters policies now. NICRIS Insurance focuses on providing clients with the appropriate suite of products to protect them, their interests, and their loved ones. If you need some advice or would like a free, one-hour personalized insurance review, we’d be happy to help online or at 516-544-0006.